I've been reading Terry Pratchett tributes all day and particularly liked Tanita Davis's at Finding Wonderland. Discworld readers will appreciate it. Also, Emily Dickinson fans. I've started my son and niece on Discworld books. If I hadn't just bought three Jane Eyre-related books for Becki, whose birthday is next week, I'd run out and get her Monstrous Regiment, one of my favorite Pratchett books. It will have to wait for another event. Check out the photo above. 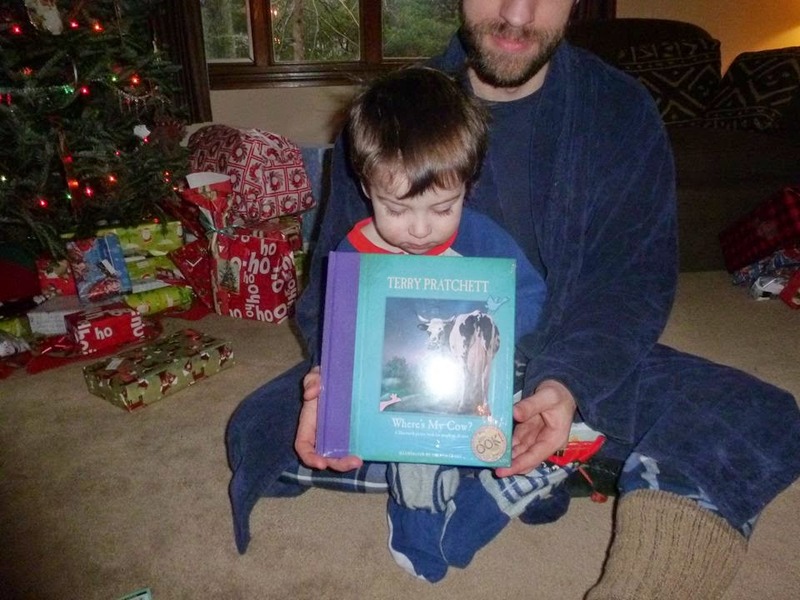 That's another generation holding his first Discworld book. Where's My Cow? is a picture book version of a story that appears in at least one of the Discworld books. Every night, Sam Vimes runs through the city to get home in time to read Where's My Cow? to his son before he goes to bed. I haven't finished all the Discworld books. Some I like better than others. I'm planning to concentrate on the City Watch books, which feature Sam Vimes. The reading can go on and on.